Social media is a phrase that we throw around a lot these days, often to describe what we post on sites and apps like Facebook, Twitter, Instagram, Snapchat and others. So you can infer that social media are web-based sites that allow people to interact with each other. But if we use the term to describe a site like Facebook, and also a site like Digg, plus a site like Wikipedia, and even a site like I Can Has Cheezburger, then it starts to get more confusing. Just what exactly is social media, anyway? The term is so vague that it can basically be used to describe almost any website on the internet today. Or can it? Some people have more of a restricted view of social media, often equating it to mean the same as social networking (a.k.a. Facebook, Twitter, etc.). Other people don't consider blogs to fall under the social media category. It seems as if everyone has their own personal opinion of what social media is and isn't. But let's dive deeper into the general concept to gain a clearer and more precise understanding. Rather than define the term using a bunch of boring jargon that would probably only complicate things further, perhaps the best way to get a clearer understanding of it is to break it down into simpler terms. To start, let's look at each word individually. The 'social' part: refers to interacting with other people by sharing information with them and receiving information from them. The 'media' part: refers to an instrument of communication, like the internet (while TV, radio, and newspapers are examples of more traditional forms of media). Yes, it's a broad definition — but keep in mind that social media is a very broad term. This is likely as specific as we can get without zeroing in too much on a more specific subcategory of social media. The following list of common features are often dead giveaways of a social media site. 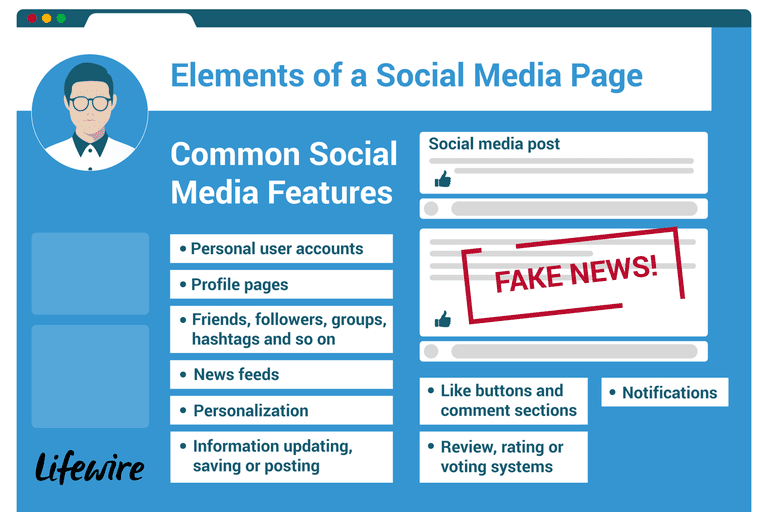 If you're questioning whether a particular site could be classified as social or not, try looking for at least one of these features. Personal user accounts: If a site allows visitors to create their own accounts that they can log into, then that's a good first sign it might be used for some kind of user-based interaction — perhaps social interaction. Although it's possible to share information or interact with others online anonymously, having to create some kind of user account first is more of a common, standard thing. Profile pages: Since social media is all about communication, a profile page is often necessary to help represent an individual and give them a space to create their own personal brand. It often includes information about the individual user, like a profile photo, bio, website, feed of recent posts, recommendations, recent activity and more. News feeds: When users connect with other users on social media, they're basically saying, "I want to get information from these people." That information is updated for them in real-time via their news feed. Personalization: Social media sites usually give users the flexibility to configure their user settings, customize their profiles to look a specific way, organize their friends or followers, manage the information they see in their news feeds and even give feedback on what they do or don't want to see. Information updating, saving or posting: If a site or an app allows you to post absolutely anything, with or without a user account, then it's social! It could be a simple text-based message, a photo upload, a YouTube video, a link to an article or anything else. Like buttons and comment sections: Two of the most common ways we interact on social media are via buttons that represent a 'like' plus comment sections where we can share our thoughts. As mentioned earlier, a lot of people user the terms social media and social networking interchangeably as if they mean the exact same thing. Although the difference is subtle, they're not the same. Social networking is really a subcategory of social media. The easiest way to understand the difference between social media and social networking is by thinking about the terms media and networking separately. Media refers to the information you're actually sharing — whether it's a link to an article, a video, an animated GIF, a PDF document, a simple status update or anything else. Traditional media was mentioned earlier on in this article just to demonstrate broader examples of media, but don't be fooled into thinking that TV, radio, and newspapers are a part of social media. At least not quite yet entirely. The line drawn between the two is slowly thinning as each continues to evolve. Social media doesn't just give you information but interacts with you while giving you that information. This interaction can be as simple as asking for your comments or letting you vote on an article, or it can be as complex as Flixster recommending movies to you based on the ratings of other people with similar interests. Social media isn't all just fun and games with your friends, celebrities you admire, and brands you follow. There are lots of common problems that most major social media platforms haven't totally solved, despite their effort to do so. Spam: Social media makes it easy for spammers — both real people and bots — to bombard other people with content. If you have a Twitter account, you've probably experienced a few spambot follows or interactions. Likewise, if you run a WordPress blog, you may have gotten a spam comment or two caught by your spam filter. Information overload: It's not unusual to have over 200 Facebook friends or follow over 1,000 Twitter accounts. With so many accounts to follow and so many people posting new content, it's almost impossible to keep up. Fake news: Fake news websites promote links to their own totally false news stories on social media in order to drive traffic to them. Many users have no idea that they're fake in the first place. Privacy/Security: Many social media platforms still get hacked from time to time despite having good security measures in place. Some also don't offer all the privacy options that users need to keep their information as private as they want them to be. It's difficult to predict anything exactly, but if one thing can be said about the future of social media, it will probably be more personalized and less noisy. Over-sharing will be less of a problem and filtering out irrelevant information will become a stronger trend. Snapchat is a social media platform that's really at the forefront of social media evolution. Rather than blasting out updates for all our friends and followers to see, we use Snapchat more like we communicate in real life — with specific people only at specific times. If anything, social media is probably about to move more toward ephemeral sharing for quicker, more intimate sharing without the stress of having to blast something out to hundreds or thousands of followers that stays up there unless it's manually deleted. The pressure of garnering tons of likes and comments on regular social media posts also plays a huge factor, suggesting that more casual forms of social sharing, such as through stories, could be the social media way of the future.